With the 2017 season firmly in the rear view, Liberty’s football coaching staff has now turned its attention toward recruiting. A new early signing period from December 20-22 and the FBS move make the next few weeks critical to the future success of the program. As Athletic Director Ian McCaw stated in our Q&A with him recently, it is imperative that this recruiting class be the best one the school has ever seen. The staff has gotten off to a terrific start with 13 early commitments including two from 3 star prospects and six from 2 star prospects. You can read more on each of these commits here, we will also have an update on their senior seasons at a later date. Gill is hoping to bring in as many as 30 new recruits in this class, including 5-6 mid-year enrollees. He hopes most of the mid-years will be junior college transfers. 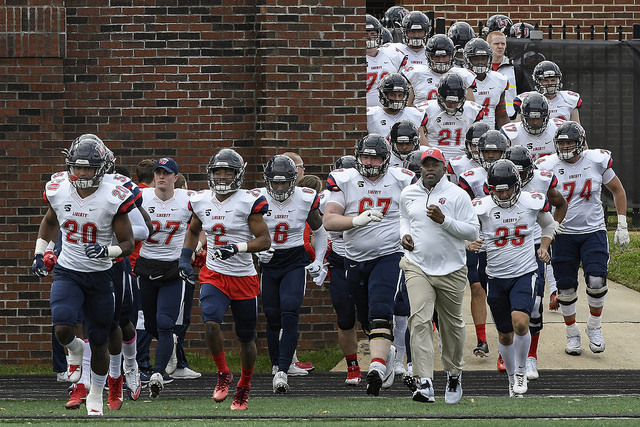 “We are focusing stronger than I ever have as a coach here at Liberty, (on) junior colleges pretty heavy, as far as recruiting those people,” Gill said. If the Flames are successful in bringing in that many mid-years, then that will leave an additional 24-25 high school student-athletes Liberty hopes to sign between the December and February signing periods. This would allow the Flames to be at the full maximum FBS scholarship limit of 85 for 2018, something that is not required for the transitioning FBS program until the 2019 season. also has offers from East Carolina, James Madison, Temple, North Carolina and Virginia. Bodden is 6’5″ and 300 pounds and is from Hoover High School in Hoover, Alabama. Liberty is Bodden’s only reported FBS offer. The Flames currently have 3 defensive line prospects committed in 3-star Michael Austin Lewis, 2-star Logan Beadles, and Emmanuel Cater. The 6’6″ and 235 pound Lewis also has offers from Army, Colorado State, Kansas State, UMass, and Navy. Beadles is 6’3″ and 305 pounds with offers from Jacksonville State, Samford, and Tennessee-Martin. Cater is 6’2″ and 260 pounds with an offer from Tennessee State. Matthews have the most experience of the returning backs. 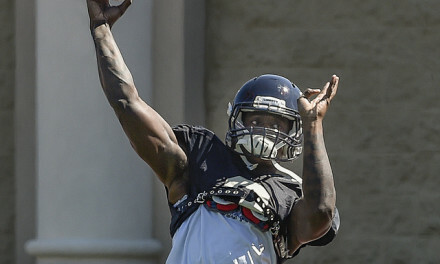 The Flames also have Mitchell Lewis, who played sparingly in 2017, and Frank Boyd, who is coming off a red-shirt season. Uriah West is the lone running back that has committed to Liberty thus far. West is a 6’0″, 205 pound prospect from Douglasville, Georgia. He also has offers from Ball State, Bowling Green, Marshall, Toledo, and Troy. West had an amazing senior season, rushing for 1,496 and 13 touchdowns on 162 carries. Gill also mentioned needing additional help at secondary, especially at the FBS level where secondary play is so crucial, and defensive backs can also find playing time on special teams. Liberty also intends on bringing a quarterback in as part of this class.